Scorched leaves flew on the wind as she made her approach. She had been stalking her prey for days, though the events that had lead her to this moment spanned decades. Ksenia tightened the grip on her daggers as she entered the cavern, where she was met with a pair of eyes that burned in the shadow. Only one dragon remained in this world, but it would fall to her blades all the same. She leapt forward and killed her opponent with a single blow. Pieces of armor, weapons, and gold dropped all around her, but she cursed as the ring she had hoped to find was nowhere in sight. "Dammit, now I'll have to grind this part for the seventh time." As the townsfolk entered the cavern to thank her for saving their lives and proclaim her the greatest Hero of all time Ksenia was already browsing through the menu to restart this particular chapter of her favorite game: 'Warrior Princess: Dragon Huntress'. Ksenia played the game whenever she had a few minutes in between the clients that visited her barber shop, but even when she was cutting their hair she sometimes felt like a fearsome warrior, ready to go toe-to-toe with even the mightiest of foes - she was a Dragon Huntress at heart! 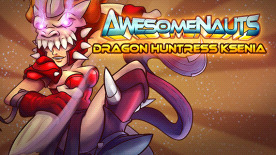 This DLC contains a custom skin for Ksenia in Awesomenauts, and comes with a fully customized voice set! If you have not unlocked the character yet, purchasing this content will do so.